How well do children navigate the ocean of information that is available online? The enormous variety of Web-based resources represents both opportunities and challenges for Internet-savvy kids, offering extraordinary potential for learning and social connection but little guidance on assessing the reliability of online information. 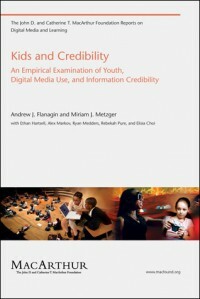 This book reports on the first large-scale survey to examine children’s online information-seeking strategies and their beliefs about the credibility of that information. This Web-based survey of 2,747 children, ages 11 to 18 (and their parents), confirms children’s heavy reliance on the Internet. They are concerned about the credibility of online information, but 89 percent believe that “some” to “a lot” of it is believable; and, choosing among several options, they rate the Internet as the most believable information source for entertainment, commercial products, and schoolwork (more credible than books for papers or projects). Most have faith in information found on Wikipedia, but they also consider an article on the Web site of Encyclopaedia Britannica to be more believable than the identical article posted on Wikipedia.Other findings show that children are appropriately skeptical of trusting strangers they meet online, but not skeptical enough about entertainment and health information found online. Older kids are more rigorous in their assessment of online information than younger ones; younger children are less analytical and more likely to be fooled.